Sothys’ Beauty Ritual – To show your skin in its best possible light! This weekend, take your time! 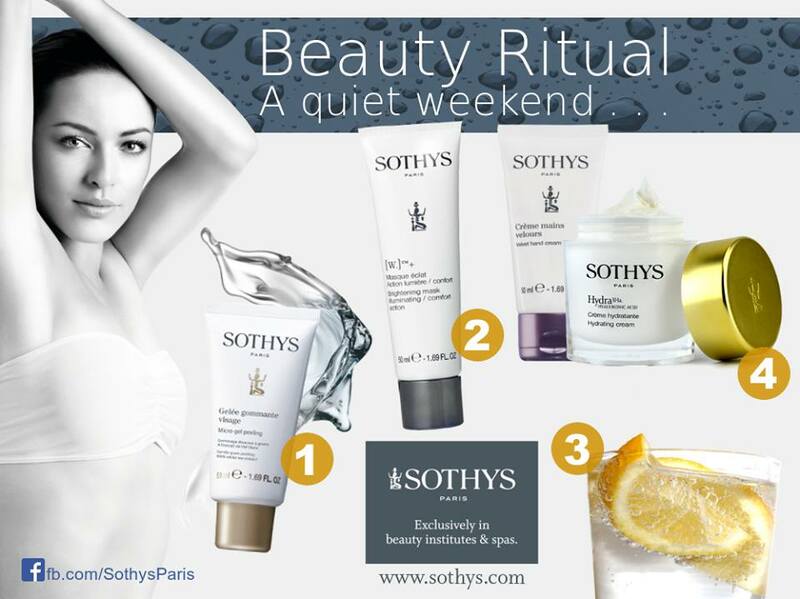 Sothys’ Beauty Ritual – To show your skin in it’s best possible light! 1) Get rid of dead cells and restore your velvety smooth skin and clear complexion. – Apply a thin layer to clean, dry skin. – Use gentle circular motions, avoiding the area around the eyes. – Emulsify with water while still exfoliating. – Apply a medium layer to your face. – Leave for 15 minutes. 3) While you’re waiting, take care of your hands! – Dip your fingers for 5 minutes in lemon water to whiten your nails. – Push back your cuticles with a cuticle pusher. – Massage around the edges of your nails with an oil- Remove your mask. 4) Finish off your ritual . – Apply your usual cream to your face and neck and don’t forget your hand cream.